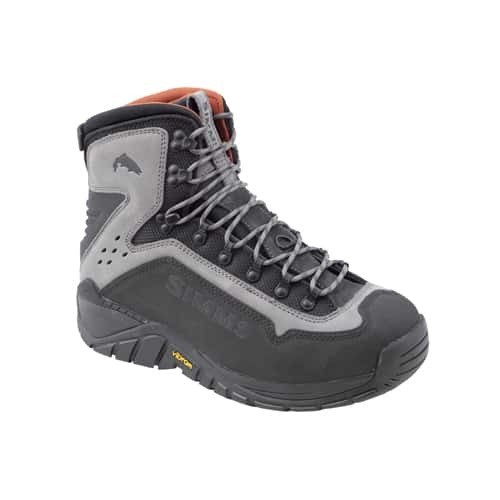 The Simms G3 Guide Fly-Fishing Boot is a feature-rich Simms fly-fishing boot that is designed with a Vibram Idrogrip rubber outsole, dual density eva midsole for shock absorption and ESS plates in the midsole for superior cleat retention. With an improved fit, the 2018 G3 Guide boot comes with a molded external TPU heel counter and heel clip for maxiumum ankle support. Even though these wading boots are extremely comfortable to wear and features awesome performance on and off the water they are not weak. Large scratch rubber rand for enhanced durability and protection as well as waterproof nubuck leather uppers and high abrasion textile are added features that make these boots extra robust and sturdy. These boots provide really great gripping power on slippery rock surfaces which is why fly-fishing guides across the country prefer the Simms G3 Guide fly-fishing boot as their go-to fly-fishing boot when fly-fishing. The Vibram Idrogrip outsole for really awesome grip on slick bedrock by way of multi-directional lugs that are compatible with all Simms AlumBite and HardBite cleats and studs, so make sure to check out this Simms G3 Guide Fly-Fishing Boot now to wear during your next fly-fishing excursion. Guides employed by those seeking to fish for example big game fishing in Sea, lakes and also rivers. Fishing guides have been important in many areas of the world, including the Norwegian coast, the Swedish archipelago, Florida coast, and north Canada rivers and lakes, etc. Fishing guides in the Gulf of Mexico are commonly referred to as a Charter Guide. There are also specialists such as a Fly fishing Guide. There are thousands of fishing guides but some are better than others. Often when searching on search engines like google, captains that pay for ad-services appear higher in priority (not necessarily when they are the best). Guides employed by those seeking to fish for example big game fishing in Sea, lakes and also rivers. Fishing guides have been important in many areas of the world, including the Norwegian coast, the Swedish archipelago, Florida coast, and north Canada rivers and lakes, etc. Fishing guides in the Gulf of Mexico are commonly referred to as a Charter Guide. There are also specialists such as a Fly fishing Guide. There are thousands of fishing guides but some are better than others. Often when searching on search engines like google, captains that pay for ad-services appear higher in priority (not necessarily when they are the best). I have not had the chance to use this item, it was purchased for an Alaska fishing trip later this year, but, the boots appear to be well constructed, fit properly and if they are up to Simms standards this will be another outstanding product. these boots replace brandXXXXX boots that failed to give proper ankle support and were just plain uncomfortable. I will edit this review after My fishing trip but right now I believe these will get the job done. I own a lot of Simms fishing gear and this is the worst piece that I own. The problem is they designed the tread so it’s higher than the cleat therefore making the cleat completely ineffective. You have rubber on the rocks and the boot is very slippery. It’s actually unbelievable that Simms overlooked this detail. If you buy the boot don’t waste your money on the cleats. I’m currently making a riser/washer to place in between the cleat and the bottom of the boot to have to cleat be in contact with the rocks. $300 investment and having to modify it to make it work...I’m not happy. on 12/7/2017 These Simms G3 Guide Fishing Boot with Vibram Soles are awesome! These Simms G3 Guide Fishing Boot Vibram soles are perfect for fly-fishing and paired with a pair of good Simms waders my fly-fishing experience couldn't have been much better, so highly recommended, just make sure to get some Simms waders with these awesome boots.